April 29, 2013 By Allyson 25 Comments This post may contain affiliate links. Read my disclosure policy. Quinoa is seriously one of my favorite foods in the world. It is so versatile and can be used in recipes that call for other ingredients such as rice, cous cous 0r some sort of filling. I recently saw a recipe where it was used in making lasagna, in place of real noodles…genius! Another one of my favorite things ever, is buffalo sauce. At points in my life I have contemplated opening a restaurant with just buffal0 flavored foods…I think it would be a great success, because it seems like anything can be turned ‘buffalo’ style, and it’s always delicious. 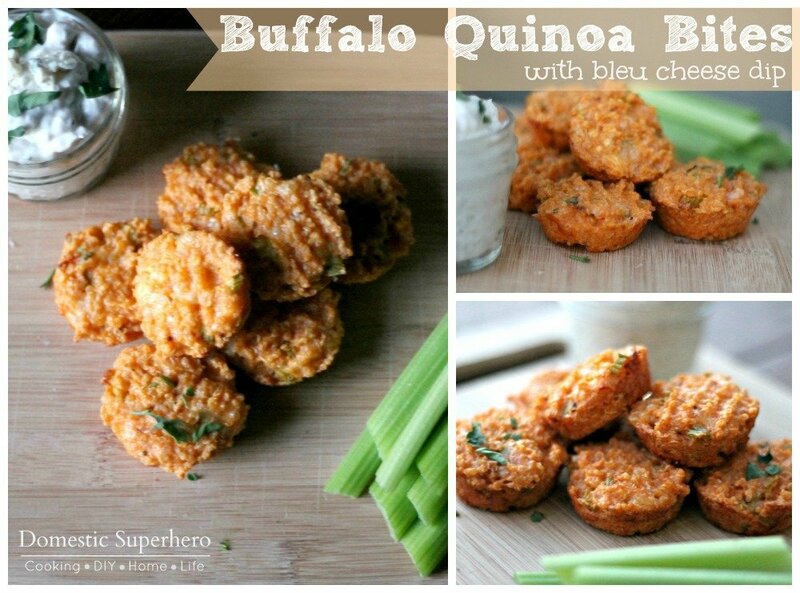 I would definitely have these little Buffalo Quinoa Bites on my menu…probably under the appetizer section. 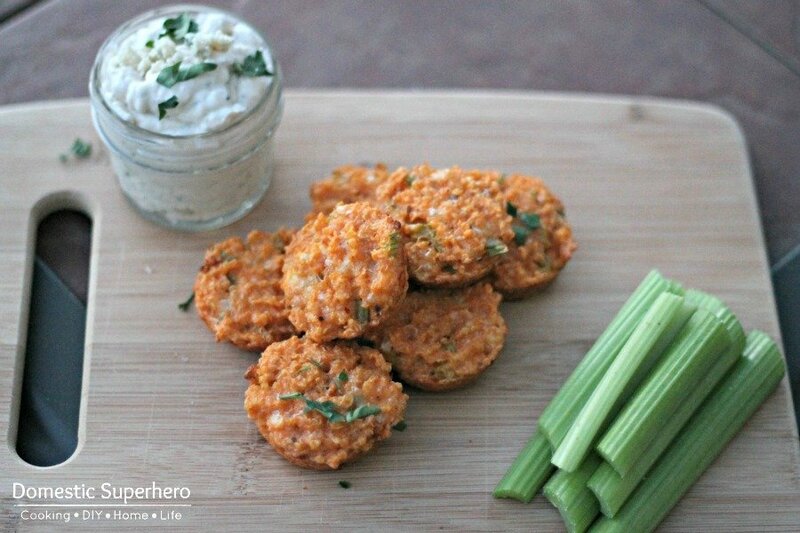 At my house we ate these as a main dish, but they seem perfect for an appetizer, or dish to pass at a party or potluck. I’ll likely bring these to parties from now on, because they totally replace the idea of buffalo wings…and they are way healthier, too. 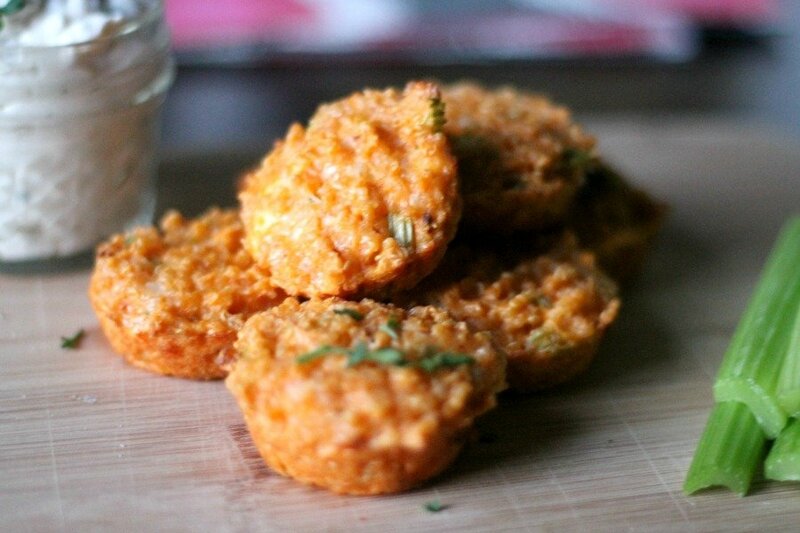 I make tons of Quinoa Cakes, and these are like a little mini version. However, instead of lightly pan frying them, I tried baking them in a mini muffin tin, which turned out to be the best idea ever. It was way faster than cooking them on the stove top, and healthier too (hey, every calorie counts!). Baking them in the tin also made them crisp all over the outside, which was way better than being soggy on the sides. If you have tried my Buffalo ‘Mac’ and Cheese (clue, it’s not macaroni, it’s quinoa! ), then you would definitely love these. In general, if you like buffalo flavor, you are going to love these…trust me. 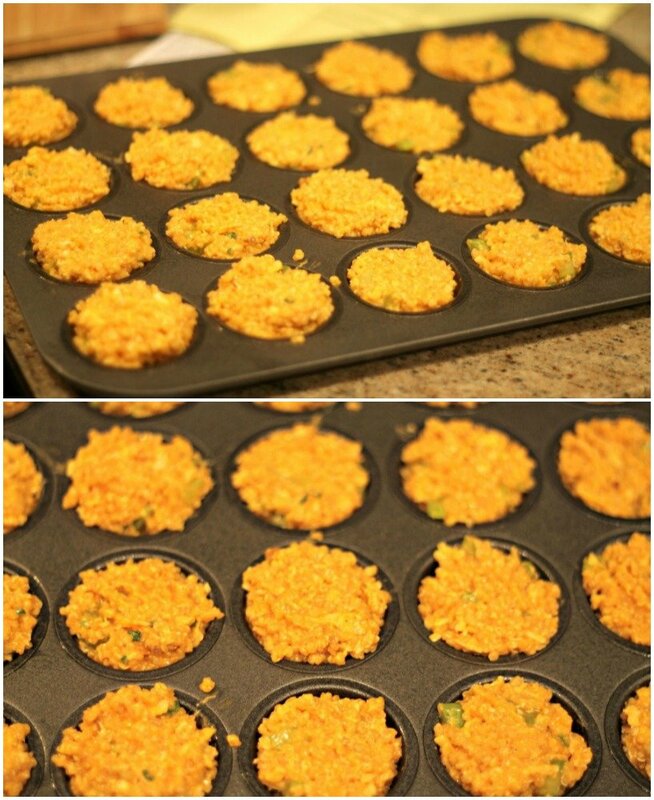 Scoop into mini muffin tins….. 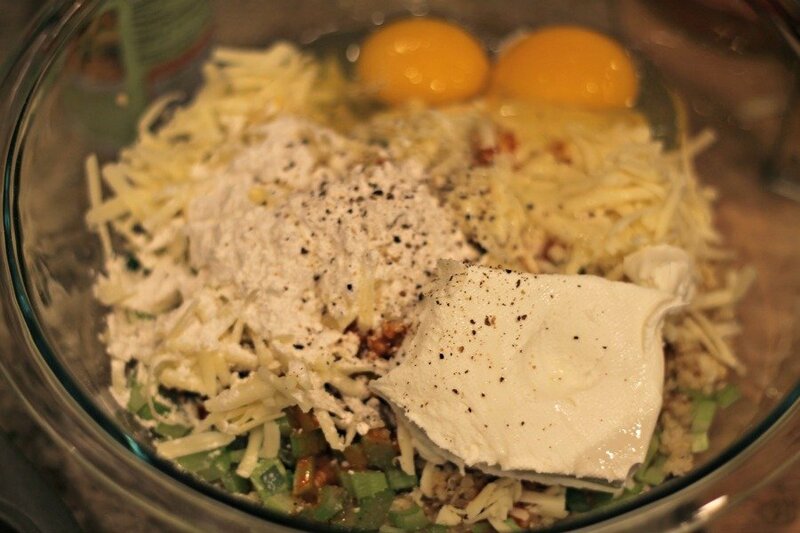 In a small bowl, mix together all the dip ingredients until well incorporated. Place in the fridge while you prepare the bites. Preheat the oven to 350°. Spray the cups of a mini muffin tin with cooking spray and set aside. In a large bowl, mix together all remaining quinoa bite ingredients until well mixed. Spoon about two tablespoons of the mixture into each of the cups of the mini muffin tin. (for me it was helpful using the actual tablespoon) Press bites down with back of a fork. Bake for 15-20 minutes or until the bites are set and beginning to brown on top. Let cool for five minutes in the pan, then remove from pan and serve warm with the dip. Serving size: About 3 bites and 2 tablespoons dip. Oh, yum! These sound delicious! Mmmmmm. This is making me hungry. I have some quinoa sitting in my pantry, this looks like a good recipe to use it in. I love quinoa, and am always looking for new recipes. Thanks for sharing this, I can’t wait to try it! I hope you like it! let me know how it goes! I’ve just discovered quinoa, and I also love it. But I never realized you could do so many things with it. I will be exploring your site for more recipes like this one. Thanks. There are sooo many delicious recipes! I really feel like the options are endless when cooking with it, and it’s so healthy and good for you! Thanks for sharing this looks great! I know my kids will love this as well 🙂 Stopping by from Tumbleweed Contessa. Have a wonderful week! Thanks for coming by, Andrea!! Thanks for linking these up at Pinterest Tuesday! These look amazing! I love your recipes, and your site! Pinned this to make this weekend. Let me know how they turn out! I hope you like them as much as we did! I have yet to try Quinoa but anything with Buffalo sauce has got to be good. Thank you for sharing on Fluster’s Creative Muster Party! WHAT?!?!?! You must try it, NOW!!! Thanks for sharing at Pinworthy Projects! And congrats on being the “most viewed food link” from last week’s party! These sound really good! I am a huge fan of quinoa, too! Oh, yum! Can’t wait to try this. Last week I made something similar, but it wasn’t in “cake” form…more like a buffalo chicken quinoa bowl. The flavors were awesome and The Husband approved! Now I have another variation to try. Thanks for sharing. I’m visiting from Just Us Four. These look delicious! Thank you for sharing them at the Pinworthy Projects Party. You will be featured tomorrow! the 2 cups of quinoa, is it 2 cups after cooked? If so, do you know how much that would be before being cooked? Probably about 1 cup uncooked! Maybe a tad bit over…like 1 and 1/4 cup dry!